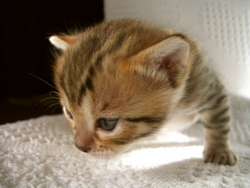 Many of the Bengal cat names listed here were inspired by Bengali names. Others were inspired by the colors these beautiful felines come in, including reddish, orange, and brown shades. Colors are always a fun source of inspiration. And yet, other names were thrown in just for fun. What about giving them a name that reminds you of their wild nature? As you can see, there are many options to choose from. As always, remember that choosing a name for your Bengal cat is a very personal matter. You don’t have to necessarily choose a name that reflects your cat’s breed or appearance, even that's always a good alternative. You can also choose a name you like based on your personal preferences. You may well call your kitty Buttons or Amy or any other traditional "cat name". Of course, it is always a good idea to consider your cat’s unique traits when choosing a name for him or her. Bengals are particularly exotic so you may want to choose a name that celebrates such uniqueness. I do hope that the names shared here give you inspiration and help you to come up with more names. The following list contains Bengali names, names of spices and colors, as well as other fun names. Still need more ideas? Here are more Bengal cat names inspired by Bengali names. Bengali (or Bangla) is an Eastern, Indo-Aryan language. Its origins can be traced back to the region of Eastern South Asia known as Bengal. This region includes present day Bangladesh, the Indian state of West Bengal, and parts of the Indian states of Tripura and Assam. If you like the exotic beauty of Bengali names, consider the following names. Bengal cats are beautiful animals, perfect exponents of both worlds: the wild and the domestic. Obviously, they deserve to have a name that does justice to their uniqueness. I hope that the names listed here have inspired you in your search for the perfect Bengal cat name.